The stakes could not be higher for the American consumer. The spread of exploitative alternative lending is accelerating the erosion of an already gravely diminished middle class. We must address this for the wellbeing of the country. While the U.S. Census Bureau report, “Income and Poverty in the United States: 2017” estimates that 2017 median household income has reached the level it had in 2007, middle class incomes have remained fairly stagnant in recent decades. Many middle class families now find themselves living paycheck to paycheck and turn to payday lenders to make ends meet, a reality lower-income groups have long experienced. Yet the institution meant to look out for consumers, the Consumer Financial Protection Bureau (CFPB), is undergoing sweeping changes that jeopardize its mission to protect consumers. The CFPB was created in 2010 to protect consumers from unchecked, unethical and predatory practices from lending and mortgage institutions. Such practices contributed to the financial crisis in 2007. The CFPB was intended to serve as a watchdog to protect all consumers, including vulnerable and disadvantaged groups, from discriminatory practices. Its aim is also to ensure access to sound consumer financial products. However, over the past two years the CFPB has been systematically weakened by its critics, chiefly Mick Mulvaney, who until recently served as the acting director of the bureau. On August 13, 2018, the Federal Reserve Bank of San Francisco published, “The Financial Crisis at 10: Will We Ever Recover?” This article predicts that the level of economic output seen before the 2007-2008 financial crisis is, “Unlikely to revert to its pre-crisis trend level,” and will cost every typical American consumer a, “Lifetime present-value income loss of about $70,000.” This loss sounds the death knell for upward mobility of the middle class and the poor, especially when considering the rapid decline of upward mobility in America since 1940. Those of the millennial generation have no illusions about the current state of the American Dream and expect that they will most likely be financially worse off than their parents. The United Way ALICE (Asset Limited, Income Constrained, and Employed) Initiative estimates that 70 percent of Americans identify themselves as middle class, yet 43 percent—roughly 51 million households—are unable to afford basic household necessitates and are often living one paycheck away from financial disaster. Payday loan lenders are alarmingly plentiful. 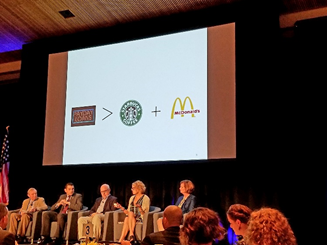 Lisa Servon, the Chair of the Department of City and Regional Planning, University of Pennsylvania, said at the Biden Challenge that there are more payday loan stores than the number of Starbucks and McDonalds’ in the US combined. Payday lenders exploit a need within the market. According to the Federal Reserve Board Report on the Economic Well-Being of U.S. Households in 2017, over 5 percent of Americans do not have a bank or credit union account. In other words, they are, “unbanked,” a condition that disproportionately affects minorities. Ten percent of African American and Latino households do not have a bank account. The alternative lenders take advantage of the situation by charging high fees and interest rates. However, payday lenders will be subject to heightened federal oversight in 2019 if the CFPB doesn’t rollback those new rules, as Mulvaney has pushed the bureau to do. The CFPB has now focused its protective and enforcement actions on older Americans and service members, but has largely curtailed such actions towards the protected classes of women and minorities. Mulvaney has stripped the fair lending office and the student loan division of its enforcement powers. Instead, he has focused these offices on education and outreach. The CFPB will re-examine and lessen enforcement of the Equal Credit Opportunity Act, which prohibits discrimination in lending. These changes clash with statutory requirements the bureau must follow, but were not contested by the receptive Republican-controlled Congress. When we understand the financial realities facing middle class and poor consumers in America, it becomes clear that every effort must be made not only to strengthen the financial system, but to push the CFPB to fulfill its statutory role as watchdog. A healthy middle class is necessary for the stability of our economy, yet the rollbacks of the CFPB’s enforcement and rule-making powers are contributing to the downward slide of the middle class. The new Democrat majority in the U.S. House of Representatives gives the public administration community an opportunity to provide effective leadership and make the case that exploitative financial lending practices must end. This effort is a vital and necessary step in revitalizing our middle class and opening up greater economic opportunity for all. Author: Parisa Vinzant is a consultant, MPA-seeking student (Biden School of Public Policy and Administration, University of Delaware), and technology/innovation commissioner in Long Beach, CA. Through her writing, Parisa seeks to apply an inclusion and social and racial equity lens to such topics as infrastructure and technology, revitalizing the middle class, and performance management. Contact her at [email protected] and @Parisa_Vinzant (Twitter).